November 6th is National Nachos Day! What better way to celebrate than by sitting down after a hard days work to enjoy a tasty platter of warm tortilla chips topped with melted cheese, green onions, tomatoes, and our favourite ingredient: Gemstone Grass Fed Beef? Wow your guests with this Taco Bell inspired recipe! Seasoned ground beef, refried beans, cheese, tomatoes and green onions make such a great flavour combination. This recipe is a winner! Keep cheese gooey and ground beef zesty! This tasty recipe cooks on the skillet, and transfers to the oven. Creating the ultimate combination of texture and flavour! Topped with onions, garlic, spices, cheese, jalapenos, and scallions. What could be more decadent? We’re always looking for unique recipes that will dazzle guests! Mmm, this dish is packed with worldly flavours: Korean-seasoned beef, caramelized kimchi, and Sriracha mayo drizzle. We’re already reaching for seconds! Don’t forget to top these off with melted cheese, onions, and sesame seeds. Quick, tasty, and healthy? That’s right, this recipe is savoury without the added calories. These delicious nachos contain seasoned ground beef, beans, onions, and bell peppers. Gooey cheese, tomatoes, avocados, and jalapenos top off this mouth-watering dish! 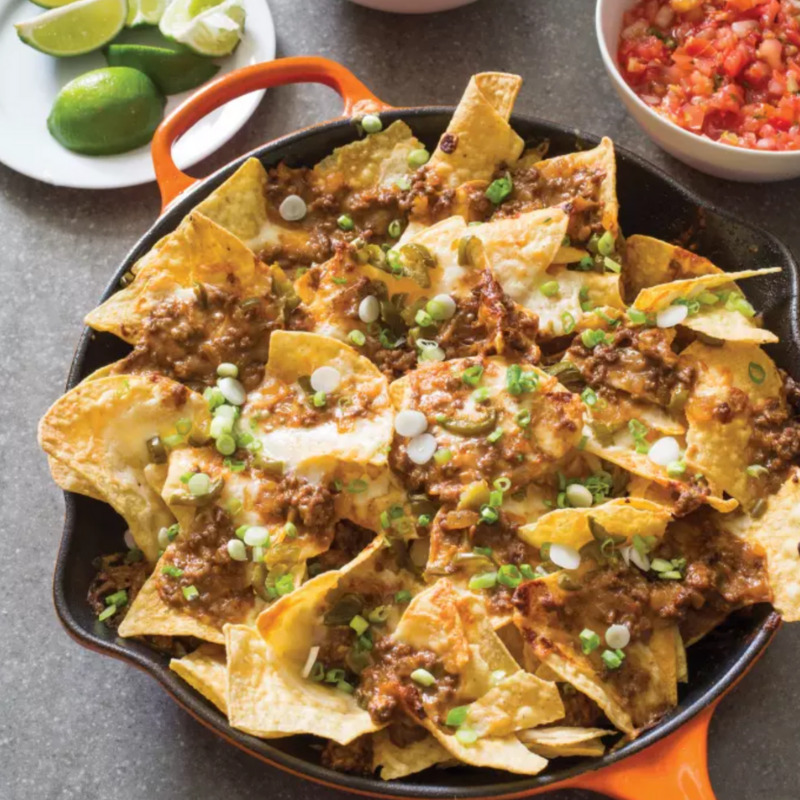 Which nacho recipe are you going to make first? Have all your grass fed beef cravings met by visiting our new online store! We offer premium cuts of meat that are grass fed and finished right here in Alberta. Why not try our Lean Ground Beef Box? You will receive 10 lbs of flavourful grass fed, grass finished lean ground beef that you will love cooking with.